Different email preview options: Normal, Hex, Mime, HTML, RTF, etc. A time come when users need to switch from Outlook email client to other email application. So, when it comes to transfer PST to Thunderbird, they need to convert Outlook data file to EML. PST File converter is a tool that helps those users to save Outlook email as EML, so that they can access it on another email clients supporting EML format. Those users who want to convert PST file into format, they can also give a go to this software. It is possible to convert each Outlook email into a single file along with embedded attachment. 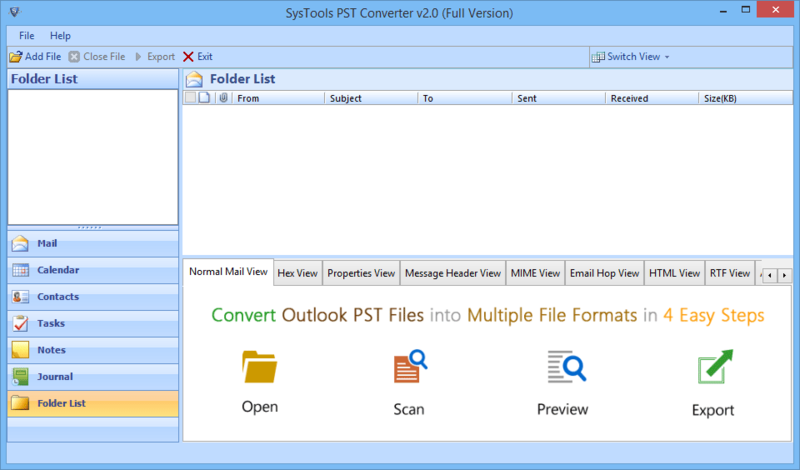 Outlook PST Converter also maintains the header portion of emails and retain it same, if you have not disable it during exportation. Generally, MSG is a common file format which is supported by Outlook email client application. 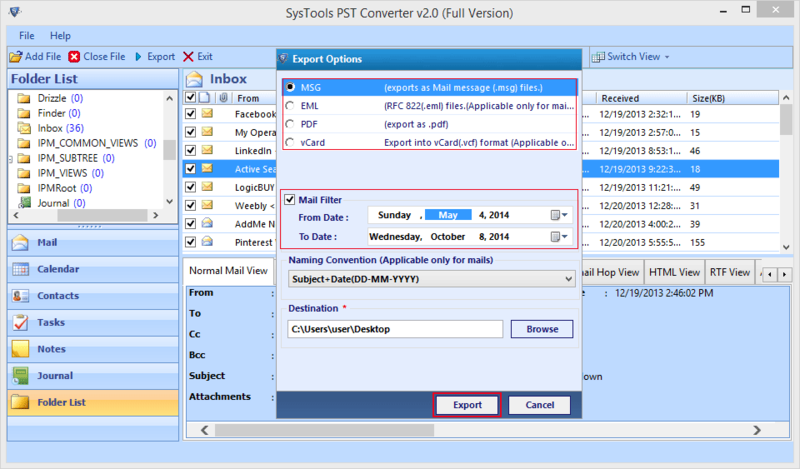 By converting PST file into MSG, users can access and read the Outlook message individually. 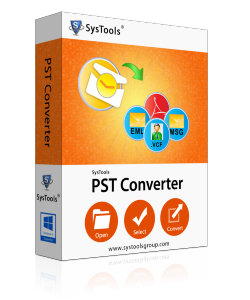 Here, PST to MSG converter is the right utility that can export Outlook data file to MSG format with no file size restriction. If you have an intention to export and access Outlook contacts on diverse email clients, then PST converter can be chosen as a trusted application. It enables users to easily export PST to vCard by which users can move the exported Outlook contacts to other VCF file supported platforms such as Thunderbird, Mac, Linux, iOS, and Android. Filtration feature of this software allows users to export data of distinctive time interval. Users need to define the stipulated time frame using "From" and "To" button and initiate the export process. Using this option, you will only get the emails between the date range, that you have defined earlier in the PST Converter software. Naming convention feature is only applicable on Outlook emails and give authentication to personalize the structure of emails in an effective way. This option comes up with several naming convention options like Subject+Date (DD-MM-YY). Using this feature, you can extract PST emails according to the defined naming conventions. Once emails are repaired, it will be loaded on the software screen and now you can view the data that PST file has. While using Outlook PST converter, you will also see several modes such as Hex View, Properties View, MIME view, HMTL View, etc. Basically, these are the various modes to read data in which different part of emails are shown by the tool. In any email client, it is not necessary that every data items/folders present in PST file are imperative to export. And to tackle such situation, this tool gives you an option to choose selective folders to convert. Before hitting on the "Export" button, just select the folders which are required to migrate and start the conversion. After scanning the PST file data, PST File Converter tool renders all the items onto the screen. With this feature, users can view specific emails in the software GUI itself and can even arrange them in ascending or descending order according to their requirement. If you have been using Outlook for last few years, then probably the interface of Outlook seems more familiar to you. Knowing this, PST Converter has designed in such a way so that users don't have to face too much complexities and could operate the program easily. As it is mentioned that the software convert even password encrypted PST file. Does this tool also unlocks them if the password has been lost? No, the software only converts the password protected PST file so that the users can move even the password encrypted file from Outlook to other file formats. To access the exported passworded PST file need to be unlocked and if the password is forgotten, then you need to recover them firstly. Is it possible to convert more than one PST to vCard, MSG, or EML file format? No, the PST File Converter software can convert one PST file at a time but after a PST is exported to your preferred format, you can proceed to convert another P ST file and so on. Moreover, there is no file size limitation, so you can convert PST file of any size. I have Outlook 2002 installed in my computer and have ANSI supported PST file. So, does this tool allow to convert to them to other formats? Yes, the software supports all versions of Microsoft Outlook whether it is 2002 or 2016 and can easily convert ANSI type PST file to EML, MSG, vCard and all other format mentioned above. What is the recommended size of PST file for conversion? Using Outlook PST Converter, one can export unlimited size of PST file which is a major advantage of this software. However, many experts suggest to keep the size of the PST file to 20GB. PST File Converter is an amazing tool that converts the entire items of Outlook data file into multiple formats in a very short span of time. Happy to get my PST file data into EML format. Now I can easily access my Outlook file as as EML file on Thunderbird email client. My office fellow suggested me this tool when I was in search of third party utility that can help me to look up inside Outlook. 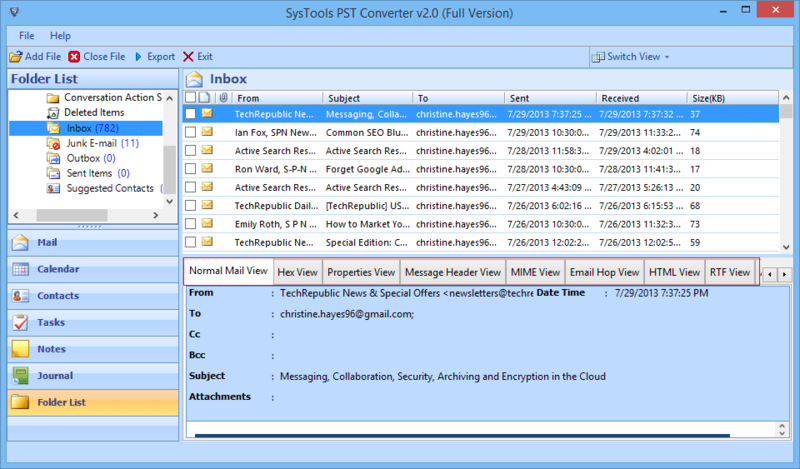 Outlook PST Converter tool for certain is what I was looking for. Thanks to develop such helpful utility for Outlook users.